Listed below is the CNA salary in Illinois for different types of health care facilities as well as the most popular cities. In the medical field, the demand for certified nursing assistants in Illinois is in demand especially know that the number of the elderly population is growing. CNAs render services to patients including attending to their basic needs, monitoring vital signs, and assisting with ROM exercises. As they implement various tasks, they are supervised by registered nurses or licensed practical nurses. 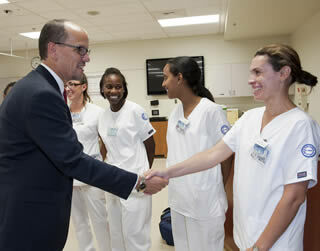 With regards to employment opportunities, the future of medical professionals like certified nursing assistants is bright. In Illinois, the average salary of CNAs for each year is ranging from $20,000 to $27,000. For entry-level CNAs, they are able to earn around $18,000. The mean hourly rate offered is approximately $11 to $16. While CNAs performs important roles in the medical industry, their salaries are worthwhile for them to live a comfortable life. Location – the cost of living of the workplace influences how much a CNA earns. Working in cities offer CNAs with higher salary wage compared to those working in rural areas. Experience – like any other career, salary depends on one’s experience. Entry-level CNAs, those who have just completed the training, earn lesser salary wage. It can be advantageous that they avail to a program wherein training is paid because they will be guaranteed with a few months of work and this can already be considered as a work experience. Having more years of experience will give you the privilege to earn higher salary wage. Employer – the employers are the ones who decide as to how much CNAs will receive for salary. Hospitals and government agencies offer higher salary wage however they are requiring CNAs to have a minimum of one year work experience for them to work in their facilities. Employers want to ensure that the clients will be able to receive high quality care. To receive your certification to work in this field one must know the basic skills and pass the state exams. Visit this page to learn more about taking CNA classes in Illinois to gain the experience and knowledge to pass the certification exams. Once one meets the requirements and passes the exams you are entered in to the nurse aide registry for a period of 24 months.